The TSA needs hire ‘spotters’. Update to this story. Police shot a jihadists knifeman who stabbed two US tourists in Amsterdam just nine seconds after he began his attack, it has emerged. 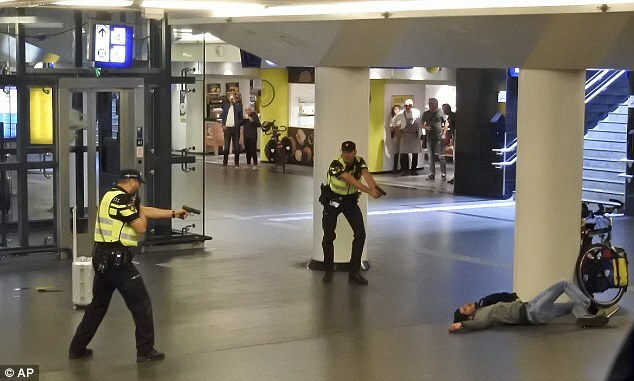 A ‘spotter’ had been tracking the 19-year-old, named as Jawed Santani, when he pulled out a blade and attacked the two 38-year-olds at the Dutch capital’s central station last week. Just moments later, the Afghan asylum seeker was shot in the hip by officers, according to Amsterdam’s police chief. The suspect had arrived on a train after travelling from his home in Piesport, western Germany, on Friday at around noon. Amsterdam’s police chief Pieter-Jaap Aalbersberg said an officer trained to spot pickpockets and potential terrorists noticed the Afghan’s ‘abnormal behaviour’ at the station. One of the Americans was knifed in the back before the second was stabbed. But by this stage police were just over 60ft away and immediately drew their weapons. Santani was shot as he ran towards another person and was later arrested. These actions had saved lives, he said, adding that police used CCTV to determine within minutes that he had acted alone.